Petey's mama was a Russian Blue and I believe his brother Hammie and sister Lucy are siblings. Lucy was the exact image of her mama but she was just adopted in January. The best feature of Petey is his pure white face, patch of grey and pink nose add an elegant softness to his strong masculine physique. When he's napping, bright pink paw pads are an artistic enhancement to your viewing pleasure. 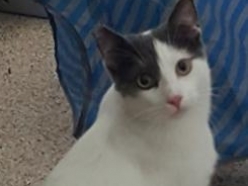 Petey is an overall winsome kitty, a lovely, loving, fun, and ever-so-royal feline companion whose endlessly pleasing personality and perpetually intriguing conviviality will be cherished for a lifetime.